Another day, another round-up. I only have about a month left of my challenge, and I’m simultaneously glad that I won’t have to pencil in time for a film every day, and sad, because it’s become part of my daily routine. Anyway, let’s get on with the reviews, shall we? P.S. You can follow me on Letterboxd to stay up-to-date with what I’m watching. OK, so this is my fourteenth (yes, you read that right) viewing of this movie. Is this the best movie ever made? Certainly not, but it’s gotten me through some of the toughest periods of my life and always manages to make me feel a little bit better. It’s cheesy and outdated, but also wholesome, inspiring, and heartwarming. More people need to watch this film and learn the lessons that are imparted about kindness and love. Another re-watch, Creep is a fantastically made, low-budget horror/thriller film that manages to unnerve and make you think, even after the initial viewing (even though some of the magic does wear off after that first time). Mark Duplass and Patrick Brice are excellent, and I’m excited to watch the sequel and see how the story continues. Just know that whenever you hear the term “peachfuzz” after viewing this film, you’ll never think of it in the same context ever again… EVER. A beautiful, heart-wrenching tale of family, loss, love, and friendship, My Life as a Zucchini (known also as My Life as a Courgette and Ma vie de Courgette) follows a young boy named Ikar, a.k.a. Courgette, who unexpectedly has to move into an orphanage. During his time there, he befriends the fellow children and the adults who care for them, and learns about everyone’s past. This isn’t your typical animated film. My Life as a Zucchini explores some VERY dark topics, and has multiple sexual innuendos sprinkled throughout the film (so don’t show this to your whippersnappers). The stop-motion animation is incredibly beautiful, and the story definitely made me appreciate what I have while also making me more aware of others and what they may have gone through. This is a mature animation that is best viewed with an open mind and a box of tissues at hand. 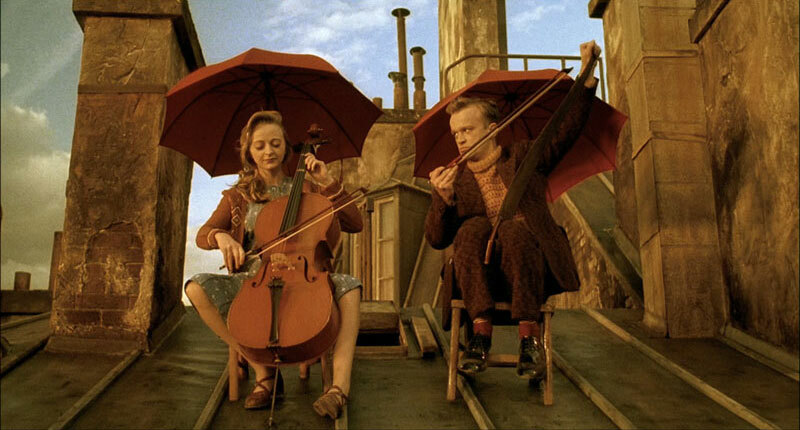 A fantastic film about cannibalism (I never thought I would say that) and friendship from Jean-Pierre Jeunet and Marc Caro, Delicatessen is set in a dystopian future where food is scarce, and specifically takes place in a building where multiple people, including a butcher, reside. The aforementioned butcher serves up human meat to his residents, and hires a man named Louison (Dominique Pinon) to both renovate his building and be the next meal served to his residents (Louison doesn’t know about this second fact). What follows is a wonderfully quirky story full of unique characters, beautiful set-pieces, and the message that anyone can change for the better, no matter the circumstances. This film will definitely not be everyone’s cup of tea, but the film is never gratuitous, and isn’t even that gory, considering the subject matter. Delicatessen is very much about human nature, and what we’ll do when we’re both desperate and caring for others. A delightful entree to be savored, if it’s to your tastes. Tales of Halloween is an anthology film centered around one town on Halloween, and for the most part is extremely entertaining. Some of the short films fall flat, and the story line doesn’t really allude to the fact that this all takes place in the same town, but the majority of the shorts are creepy and well-acted. If you’re looking for a good film to watch to get in the mood for Halloween, this is an admirable effort chock-full of incredible actors (including Barbara Crampton, Sam Witwer, Alex Essoe, Lin Shaye, and many more). This movie isn’t as bad as a lot of people make it out to be, just incredibly average and messy. Tom Cruise is charismatic as always as Nick Morton, and the supporting cast (Russell Crowe, Sofia Boutella, Annabelle Wallis, and Jake Johnson) give it their all, but sadly, their acting doesn’t help the uneven pacing, sometimes iffy effects, and poor script. The action set-pieces are awesome, though, and I felt like I was watching a film version of the video game Uncharted. The Mummy is a disappointing first entry into Universal’s Dark Universe franchise, but it’s not as horrid as it’s made out to be. It’s a perfectly fine popcorn action film to turn your mind off for. Check out my video review for my full thoughts on this film! I finally got around to watching Pacific Rim, and I pretty much adored it. Charlie Hunnam, Idris Elba, Charlie Day, and Rinko Kikuchi are badass, and the visuals are eye-meltingly gorgeous. The action is fun and punchy, and the themes of family are wonderful. Guillermo del Toro’s direction is fantastic, and I loved the designs of the kaiju and the jaegers. My only gripe with this movie is the fact that it’s a little too long, and some scenes are just outright boring. Other than that, this is a fun sci-fi/tokusatsu film that will appeal to fans of these genres. 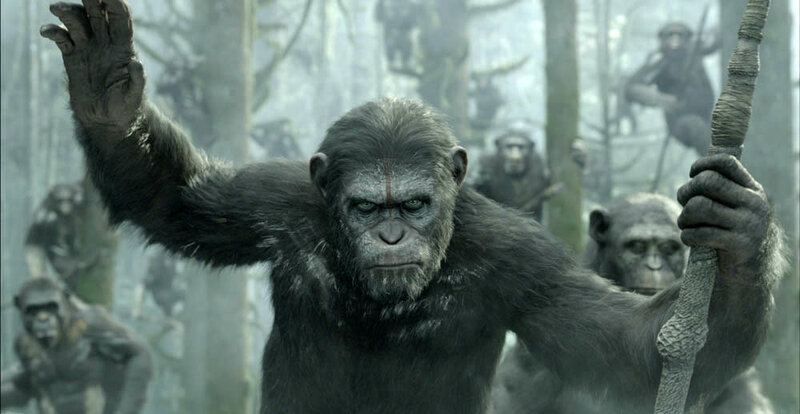 A fantastic sequel to the surprisingly excellent Rise of the Planet of the Apes, Dawn continues the story of Caesar (Andy Serkis), and chronicles life after the simian flu has wiped out the majority of mankind. The apes soon discover a small enclave of human survivors (among them Jason Clarke, Keri Russell, and Gary Oldman), and must decide whether to trust these humans, or rid the world of their presence. As usual, the visual effects are outstanding, with the apes looking incredibly realistic. The acting and mo-cap are fantastic, and the story is compelling. This film does start off slow, but quickly picks up the pace, making you care about both sides in this conflict. Now I just need to see War for the Planet of the Apes. What a dreadfully dull film. Cube is centered on a group of people who find themselves inside a room with six different hatches. Each hatch opens to another hatch, again containing six hatches. The catch? Some of the rooms are booby-trapped. The victims have to find their way out of this hellish environment, before they perish from either starvation and thirst, or from a deadly trap. It sounds exciting, right? Well, it’s not. The characters are all pretty much unlikable, and there’s too much boring exposition and not enough of an actual threat. The concept is awesome, but the execution totally fails. Next Post The Jigsaw Tag!